Render the bacon in a frying pan. Once rendered, remove the bacon onto a paper towel to absorb all the excess oil. Retain the rendered bacon fat in the pan. Into the same pan, add the mushrooms, shallot, and garlic. Saute for a few minutes until shallot is softened. Remove the mixture from the pan and add the fresh spinach. Cook for a few minutes until spinach is wilted down. Dice the rendered bacon into small bits. Combine with mushroom mixture, wilted spinach and smoked paprika. Set aside. 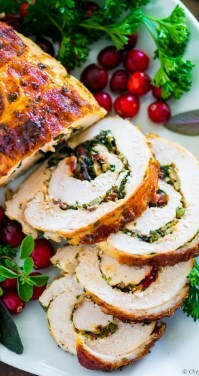 Remove the turkey breasts from refrigerator. Using a sharp knife, butterfly the meat along its natural sectioning, creating a more flat piece of meat. Cover the meat with 2 layers of cling wrap and use a meat mallet to pound the meat thin, to about 1/4-inch. Season the meat with kosher salt and black pepper. Spread prepared filling over the meat, leaving a 2 inch strip uncovered, lengthwise. Start from one end and gently roll the meat and filling into a log. Use kitchen twine to secure the roll. Preheat a large pan over medium heat and add a drizzle of olive oil. Place the roll seam side down first. Brown the roll on all sides, using tongs to turn the roll. Divide the butter into small pieces and place directly on top of roll. Transfer the roll into the preheated oven and bake until internal temperature reaches 160F, about 25 minutes. While the roll is baking, baste it periodically with the melted butter. Remove roll from the oven once it reaches 160F and let the roll rest for 15 minutes before cutting into slices. Serve with oven-roasted vegetables and/or salad.